I've "known" Julia Billings (her blog is Woolen Flower) from around the halls of Ravelry for many years now. 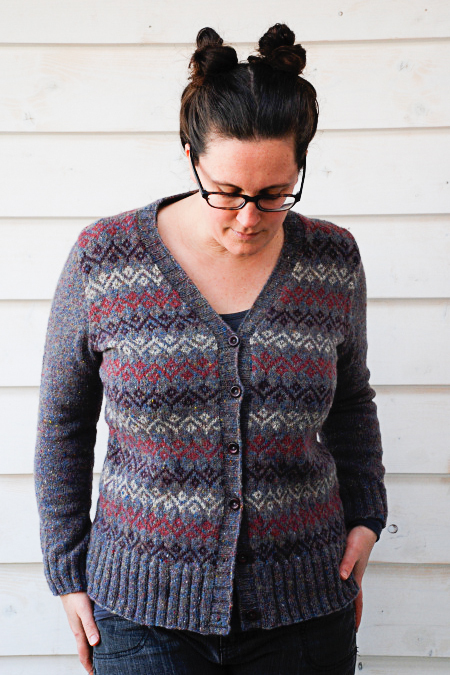 I remember the first garment of hers I really adored was a pattern called Kaari by Norah Gaughan. I have always wanted to try it and loved her version. Gorgeous photos and gorgeous knitting. Jules is multi talented worker of yarn. Machine knitting is one of her many talents - she is in the process of setting up a shop to sell her beautiful colourwork cowls. She also does gorgeous handknitting and is teaching both our dyeing classes - natural dyeing and indigo dyeing. Her classes have been super popular already! Ever since I called her out of the blue about this project she has been so generous with her time and super enthusiastic and supportive. I have seen her in action and know she is also a fantastic teacher and just generally really lovely. I'll hand over to her now so we can hear about more about her and her craft. She is an inspiring woman! 1. What brought you to craft or make? Both my parents are really interested in design (my mum is a super talented sewer and knitter and my dad has the most fantastic eye for colour, pattern and line) and so our house was full of beautiful and eclectic art, furniture and textiles. Being surrounded by all that beauty rubbed off on all of us but it was working towards my craft badge for Brownies that really got me started making things, rather than just looking and touching and dreaming about them! Over the years, I played around with lots of different crafts but never really stuck with anything... and so, not long after I started knitting ten years ago, I remember making a conscious decision to learn everything I could about it- I wanted to know this craft inside out. I’m still working on that! But it’s one of the things I love about teaching people to knit- there is such a thrill in trying new techniques and building up skills and seeing them work in a project. 2. What do you love about your chosen craft? Portability is a big plus- I always have my knitting with me in case I have the time for a few rows. I definitely have a slapdash side and the fact that knitted fabric is very forgiving means I can get away with less precision than in sewn garments! I also love the connection that working with yarn gives me to its source- knowing where, how and from what the yarn was made from is part of the joy for me. But the thing I most love is the sheer tactility of knitting- it always feels good in my hands and does a wonderful job at keeping me warming and happy. I’m really into combining colour and pattern in knits and so I love how dyeing and working on a vintage knitting machine both add a lot to what I can do. Dyeing gives me colours I’d never be able to buy and my vintage Singer allows for a huge amount of sampling and experimenting. 3. When/how do you make time for craft in your life - do you have a process? I’m lucky because working in a yarn shop means that I spend most of my day talking about knitting with my customers or colleagues... so ideas are always floating around my head. I block time out each week for the knitted accessories I’m just starting to produce and for other work-related things but the evenings are mine for my own personal knitting! And I’m lucky enough to go away regularly with an amazing bunch of craftswomen and always come home thoroughly inspired- I think it’s so important to make time to spend time with people who love craft too. 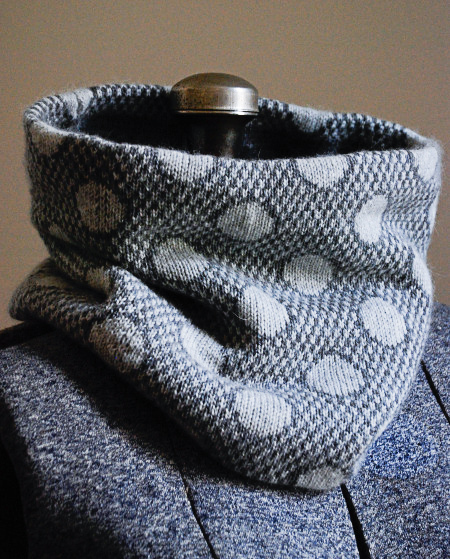 One of Jules' gorgeous machine knit cowls. So many places! Plants are a big one for me; their shapes, colours and textures never stop surprising and astounding me. Traditional textiles, whether plant-dyed rugs, Harris Tweed with its combination of muted and mad colours or colourwork knitting from Fairisle, Scandinavia and the Baltic. Textures and patterns in architecture. Talking with others about their craft. 5. Who are your top 3 crafting heroes and why? Kate Davies for her immense talent in combining traditional knitting techniques, beautiful and thoughtful details and great pattern-writing to create lovely, well-fitting designs. My dyeing teacher Robyn Heywood for her incredible generosity and willingness to share her enormous knowledge of dyeing with natural materials. Jared Flood for his commitment to supporting and encouraging upcoming knitwear designers and creating beautiful locally-produced yarn in incredible colours. He also designs beautiful knit patterns!